Lemon pickle (or preserved lemon) brings a strong lemon flavor to any dish. You can make your own from scratch, or you can buy them in a jar. They add a flavor that’s umami, floral, and acidic all at once. Many people associate them with Moroccan cuisine, especially tagine (a hearty stew cooked in an earthenware pot). This recipe takes elements of a tagine, and reimagines them to create a hearty, delicious plant-based stew. While you can cut up a fresh lemon and substitute it for the lemon pickle, it won’t be the same. If you don’t already use lemon pickle on a regular basis, this recipe will inspire. It seems like there are so many ways to use them to bring more flavor to dishes—throw some in a pesto, bring a tapenade up a knotch, chop one finely and add to roasted vegetables, add to soups (what lentil soup wouldn’t love some lemon pickle??!). For this recipe, I also used a prepared Ras el Hanout spice mix, but you can also make your own. 1. In a deep, heavy pot or dutch oven, add olive oil, onion, garlic and a generous pinch of salt. Saute over medium-low heat for ~7 minutes or until onions are totally limp and translucent. 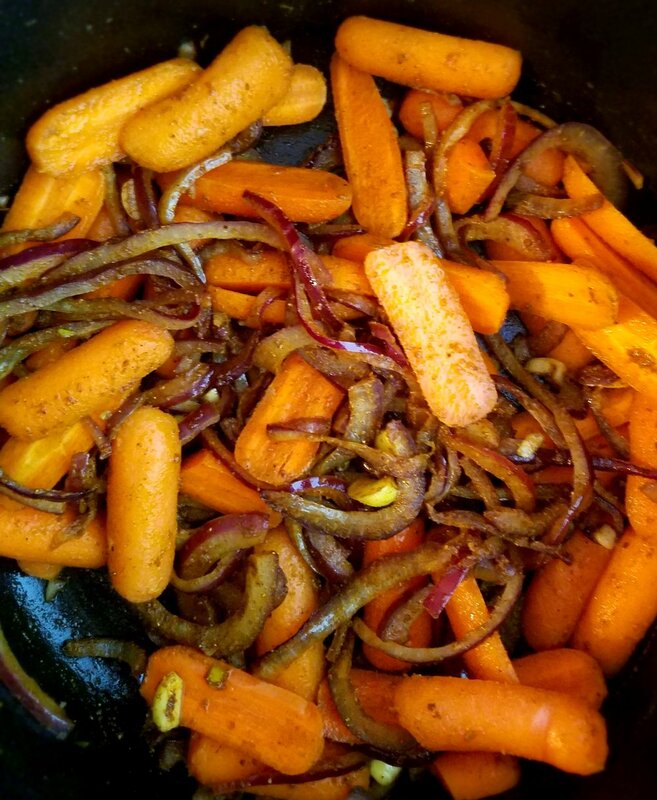 Add ras el hanout and carrots. Sauté for another 3-5 minutes over low heat. 2. Add tomatoes, chickpeas, lemon pickle, dried apricots, green olives, bouillon, and saffron (if using). Cover with a lid and simmer on low for 45-50 minutes or until carrots are soft. During the last 10 minutes of simmering, add the cinnamon stick. Serve over couscous and top with cilantro or parsley.